School girls admire samurai armor displayed in front of banners bearing the crest of the Tokugawa Shogunate at the Exhibition of Arts and Manufactures in Kyoto, better known as the Kyoto Exposition (京都博覧会). 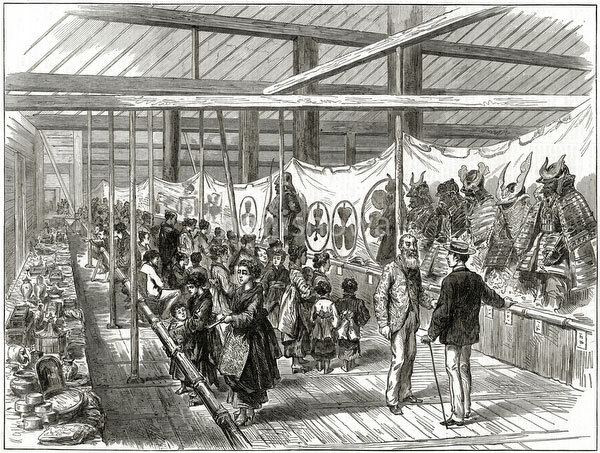 The two Japanese men in Western clothes in front are involved with the organization of the exposition. The exhibition was held from March 10 through May 30, 1872 (Meiji 5) at the Buddhist temples Nishi Honganji, Kennin-ji and Chion-in (西本願寺・建仁寺・知恩院) and attracted a large number of foreign visitors, which until then generally had not been allowed to enter Kyoto. The exposition was held almost every year though 1928 (Showa 3). The famed Miyako Odori (都をどり), dances performed by a large number of Kyoto geisha, were launched during the 1872 exhibition. Held at a small theater near Gion, the dances were made a bit coquettish in order to appeal to a foreign audience. From the following year, the dances were held at Kaburenjo (祇園甲部歌舞練場), which was specifically built for Miyako Odori. Although considered traditional today, compared with Japanese stage performances of the time, Miyako Odori was new and original. Published in the Illustrated London News on October 19, 1872 (Meiji 5). Original text: “Exhibition of arts and manifactures at Kioto, Japan.” Art by English artist and cartoonist Charles Wirgman (1832-1891).